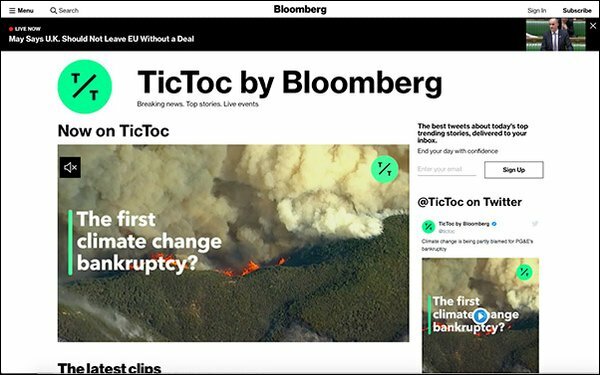 As anticipated last year, TicToc, Bloomberg Media’s round-the-clock Twitter news network, launched as its own digital video platform Tuesday, according to Axios. The network, which first appeared in December 2017, has spent the past year establishing its brand with expansions across podcasts, newsletters, live events and into international markets, like Hong Kong and London, growing its audience along the way. The mobile-first iteration of TicToc will live on the site www.TicToc.video and features a “feed-like interface” with video offering users various options, including watching with or without sound with data, along with text and images tailored to a mobile news audience. While TicToc still publishes to viewers’ social media feeds, the brand hopes to draw users directly to its site. In that same memo to Bloomberg Media’s global team, Smith addressed the success of TicToc and other products as the company exits a banner 2018. “TicToc continues to redefine news consumption for next-generation professionals who crave mobile-first video news they can trust,” Smith wrote. He added that TicToc is now in more than 30 airports across the U.S. and Canada and is preparing the launch of its first foreign-language edition. In addition to acknowledging today’s launch, Smith wrote that Bloomberg Media anticipates that TicToc will stream on OTT platforms starting later this year. Aside from TicToc, Bloomberg Media hit record revenue in 2018 with 16% year-over-year growth. According to Smith’s memo, digital advertising revenue grew 15%, new digital format advertising rose by 44% and Bloomberg Live revenue jumped 82%. “Our priority for 2019 is to double-down on our strategy of innovation-based growth,” Smith wrote. He cited four businesses poised for expansion and integration across the company’s present lineup of products, platforms, services and teams. Bloomberg Media projects double-digital year-over-year growth in 2019, with a strong first quarter expected. Among those areas expected to expand are TicToc and The New Economy Forum, which the company wants to build into a year-round global media platform. Bloomberg Media has also set the goal of increasing subscriptions by 60% in 2019, leveraging in-house data, group subscriptions and a bolstered customer service center. The company tripled its first-year subscriptions in 2018. The company will focus on international expansion this year, with a new TV station set to launch this spring in Beijing and a second studio in Shanghai planned. Bloomberg Media plans to pursue TV, digital content expansions in Israel, Switzerland, Middle East and Latin America. Bloomberg LIVE events will expand globally as its Bloomberg Equality Summit launches in London and Dubai.